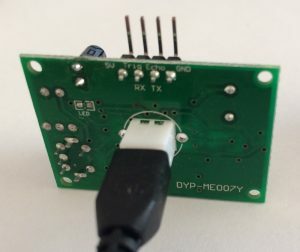 There are two main versions of the DYP-ME007Y ultrasonic module (see here to tell the difference) – this article is about interfacing and taking readings from the serial output version. At the labs, we have been working on interfacing one of these with the NodeMCU – an Arduino-type device with built-in Wifi. This is in order to create a water tank level sensor. The automotive ultrasonic sensor lends itself to this application in that there is no need to add waterproofing – it is already there. To interface with it we need to convert the 3.3V digital in/outs from the NodeMCU to the 5V required by the DYP-ME007Y. If you were using a 5V Arduino, you wouln’d have to do this. For us, we use a bi-directional logic level converter which is available from eBay. 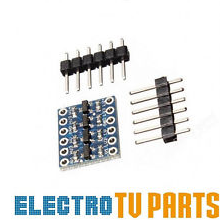 We bought from Electro TV Parts because they stock them in the UK and so shipping is fast. We are only using two of the four channels on the converter. These are for the two sides of the serial connection between the NodeMCU and the DYP-ME007Y – RX and TX. The converter also needs 5V, 3.3V and GND, which are all available on a pins of the NodeMCU board. On the NodeMCU, we then need to choose two digital pins for the serial connection, and connect these to the LV (low voltage) side of the converter. The HV side connects to the DYP-ME007Y RX and TX pins. It also needs 5V and GND. For the serial connection, the pin assigned as TX on the NodeMCU connects (via the converter) to the RX pin on the DYP-ME007Y, and RX on the NodeMCU to TX on the DYP-ME007Y, also via the converter. That’s just how serial works! Now on to the coding. We use SoftwareSerial to assign the two digital pins as the TX and RX on the NodeMCU, then we are ready to read the results from the DYP-ME007Y. // pin assignments. TX on the arduino connects to RX on the sensor, RX to TX. Here you can see I am using pre-defined constants (D3/D4) for the NodeMCU in the Arduino dev environment. We also define how many times we will try to read the serial before giving up. This allows trapping of the situation were there is nothing coming from the DYP-ME007Y – like if it was not connected. We are also starting up the serial connection to the computer it is connected to so we can see debug information. ..which just calls a subroutine to read the sensor and then prints the result to serial. // we want a 255 which is the start of the reading (not msb but saving a byte of variable storage)..
// now we collect MSB, LSB, Checksum..
// is the checksum ok? GetDistance() returns a signed integer of the distance in cm, or -1 if it returned bad data, or the serial read timed out. Keep reading until we receive a 0xFF which is the start byte. Now read the most significant byte (msb). Read the least significant byte (lsb). Calculate the checksum and compare to the one sent from the device. 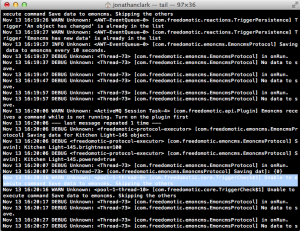 If checksum matches, it’s a good reading and so return it. If not, return -1. It makes no attempt to decide whether the sensor has actually sent a meaningful result, just that what we received matched what it sent. 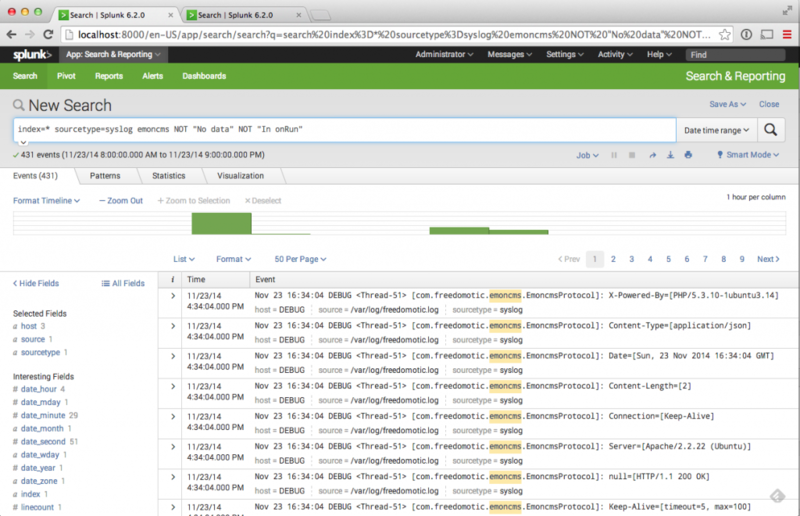 More of validating the results in a later article. Reads a DYP-ME007Y TX ultrasonic sensor and writes the distance to serial. This entry was posted in Arduino, Building Automation, Development, NodeMCU on August 24, 2017 by Jonathan Clark. In order to build a tank level monitoring device, we recently bought a pile of DYP-ME007Y ultrasonic devices. 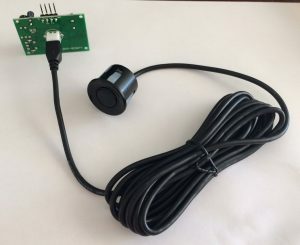 We chose the single sensor version with the automotive sensor used for car parking distance when mounted on the bumper. Having tried to use both the manual ‘pulse-trigger then measure the response’ and NewPing code, we gave up. It turns out that there are two (well, actually three) different versions of this module, and it is not that obvious which one is which. The two versions are Pulse Width Modulation (PWM) and Serial. The PWM one requires a trigger input to fire it and this flashes the LED once. You then read the pulse from the Echo output. The Serial version constantly takes readings, and outputs a distance value in mm in serial. The constant readings result in a flashing LED as soon as you apply power. The PWM version is well-documented, and easy to interface with on Arduino using the NewPing library but the Serial version is not. There is no way of telling from the markings on the board as these show the pin assignments for both versions. However, our testing shows with the automotive sensor the minimum distance is 30cm. 0xFF: frame start marker byte. H_DATA: distance data of high eight. L_DATA: distance data of low 8 bits. This entry was posted in Arduino, Building Automation, Development on July 31, 2017 by Jonathan Clark.